Posted November 23, 2015 by Charles Morris & filed under Newswire, The Infrastructure. EVSE manufacturer Efacec Electric Mobility has licensed Qualcomm’s Halo wireless charging technology. 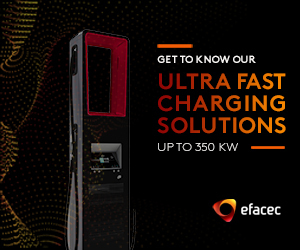 Portugal-based Efacec (profiled in the May/June 2015 issue of Charged) has installed over 600 DC fast chargers around the world. It plans to commercialize Qualcomm’s Wireless Electric Vehicle Charging (WEVC) systems and provide them to the EV Supply Equipment (EVSE) industry. Qualcomm’s Halo system features a BiPolar base pad architecture designed to allow efficient coupling to various vehicular pad architectures such as Circular, Solenoid, and Double D magnetics. I wonder if you can wirelessly charge at the same time as a plug in charge? Thereby, theoretically, doubling your charge and reducing your overall charge time. Would you be able to get 5-7kwh per 30mins in a combo situation like this?